When your fish are having a bacterial infection, they will display a lack of appetite and appear lethargic. Their color may become pale, and it’s highly possible that you will see skin ulcers or skin hemorrhages on your fish. Although most bacterial infections can be treated effectively, you must not neglect the symptoms. Did you notice that a handful of fish has died simultaneously in your pond? Or have you noticed that your fish look stressed and have mucus-looking substance on their gills? Another telltale sign of fungal attacks is when your fish encounter a change in color (white, red or gray). 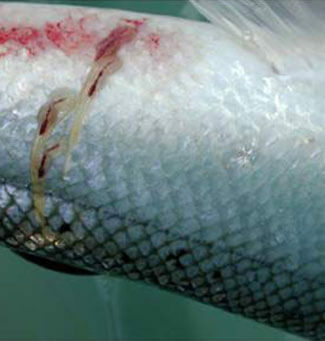 There are many symptoms that can point to the fact that skin parasites are hurting your fish. From lethargic-looking fish to frequent gill movements to ulcers and sores to a milky look on your fish, it’s possible that you are facing the possibility of skin parasites in your pond. When you see that your fish have an enlarged spleen or kidney, develop lesions on their gills, display ascites, or a darker change in skin color, all these signs can point to a possible case of virus attack on your fish. Try Fitz’s Fish Ponds for Pond Fish Care Services Today! At Fitz’s Fish Ponds, we are very knowledgeable when it comes to common fish ailments and how to treat the different pond fish phenomena. Whether you are facing a pond emergency or you are just starting to see the onset of certain fish problems, let us help you tackle the situation effectively. Call us today at (908) 315-7370 or send us an email at sales@fitzfishponds.com to learn more about our pond fish care services!